Lot 63. Macedonian Kingdom. Philip II. 359-336 B.C. Æ unit (17 mm, 5.99 g, 1 h). Uncertain Macedonian mint. 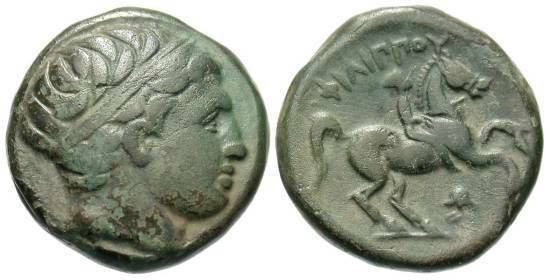 Male head right wearing taenia / ΦΙΛΙΠΠΟΥ, Youth on horse galloping right; below, helmet. HGC 3.1, 882; SNG ANS 8, 857. Dark green patina. Very fine.